As a progressive discipline [biochemistry] belongs to the present century. From the experimental physiologists of the last century it obtained a charter, and, from a few pioneers of its own, a promise of success; but for the furtherance of its essential aim that century left it but a small inheritance of facts and methods. By its essential or ultimate aim I myself mean an adequate and acceptable description of molecular dynamics in living cells and tissues. 'Some Chemical Aspects of Life', Address (Sep 1933) in Report on the 103rd Meeting of the British Association for the Advancement of Science (1933), 3. As an eminent pioneer in the realm of high frequency currents … I congratulate you [Nikola Tesla] on the great successes of your life’s work. I enjoy, and always have enjoyed, disturbing scientists. 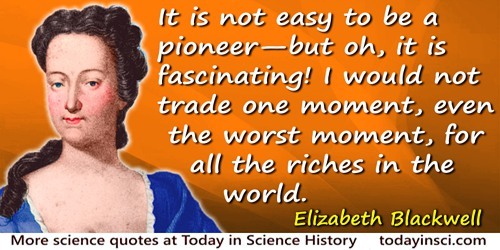 It is not easy to be a pioneer—but oh, it is fascinating! I would not trade one moment, even the worst moment, for all the riches in the world. As quoted, without citation, in Arlene J. Morris-Lipsman, Notable Women (1990), 70. The author dates this to “twenty years after her graduation,” [which was on 23 Jan 1849]. Please contact Webmaster if you know the primary source. It is often held that scientific hypotheses are constructed, and are to be constructed, only after a detailed weighing of all possible evidence bearing on the matter, and that then and only then may one consider, and still only tentatively, any hypotheses. This traditional view however, is largely incorrect, for not only is it absurdly impossible of application, but it is contradicted by the history of the development of any scientific theory. What happens in practice is that by intuitive insight, or other inexplicable inspiration, the theorist decides that certain features seem to him more important than others and capable of explanation by certain hypotheses. Then basing his study on these hypotheses the attempt is made to deduce their consequences. 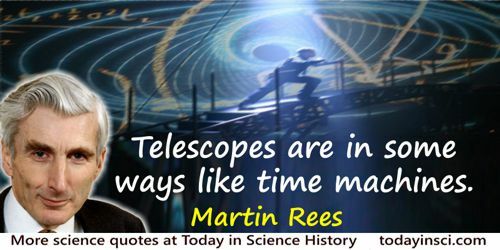 The successful pioneer of theoretical science is he whose intuitions yield hypotheses on which satisfactory theories can be built, and conversely for the unsuccessful (as judged from a purely scientific standpoint). Co-author with Raymond Arthur Lyttleton, in 'The Internal Constitution of the Stars', Occasional Notes of the Royal Astronomical Society 1948, 12, 90. Start of Boeing’s quote, inscribed on his memorial at the Boeing Developmental Center, Tukwila, WA, as given in Mike Lombardi, 'Historical Perspective: 50 years at the Leading Edge', Boeing Frontiers (Aug 2009), 8. New frontiers of the mind are before us, and if they are pioneered with the same vision, boldness, and drive with which we have waged this war we can create a fuller and more fruitful employment and a fuller and more fruitful life. Letter to Vannevar Bush (17 Nov 1944). As printed in Vannevar Bush, Science, the Endless Frontier: A report to the President (1945), viii. You can always tell the pioneers because they are face down in the mud with arrows in their backs. Seen in various paraphrases, such as $ldquo;in the dirt”.